Widely distributed and local throughout England but not recorded from the northeast or north Wales. Most common in the southeast with many records along the Thames to Berks (Luff). There is a single record from Orkney (Welch). Generally found among leaf litter or under logs in woodland. Around Watford it is common throughout the spring and summer under logs in Whippendell wood and Oxhey park where the ground is damp and shaded. 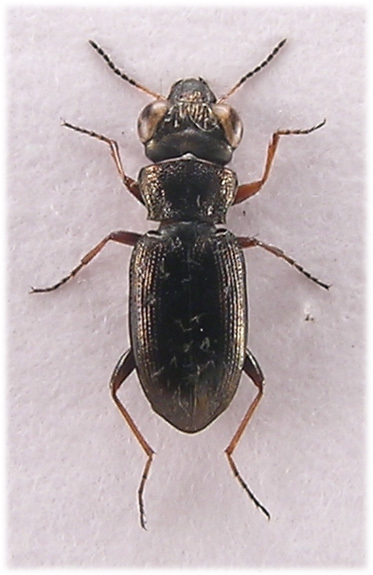 Usually found singly and often with Abax, Pterostichus madidus and Ocypus olens. Specimens were occasionally found during the winter 2006/7 among leaf litter samples. Breeds in the spring. With experience this species can be recognised in the field with a X10 lens, the combination of dark elytra, wide second interstice and pale legs make it distinctive. 5.5-6.5mm. 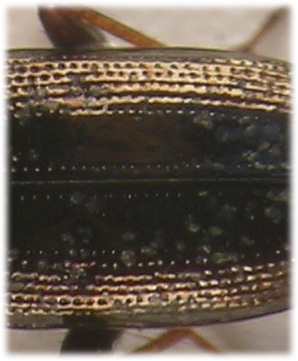 Antennae black with four basal segments yellow. Head very large, even for Notiophilus. Frons between eyes (Carinae) shining, posteriorly with shiny granulate microsculpture and punctate laterally. Pronotum transverse and strongly bordered laterally, with coarse puncturation except for the disc and deep longitudinal basal foveae. Elytra entirely dark or obscurely red apically, shiny but for strongly microsculptured apical area. Second interstice at middle more than 3X wider than third, fourth with 3 large punctures, 1 before middle and 2 subapically. Legs light brown with femora (especially hind pair) and apex of tarsi darker. Basal pro-tarsal segments dilated in male. Welch, R.C. 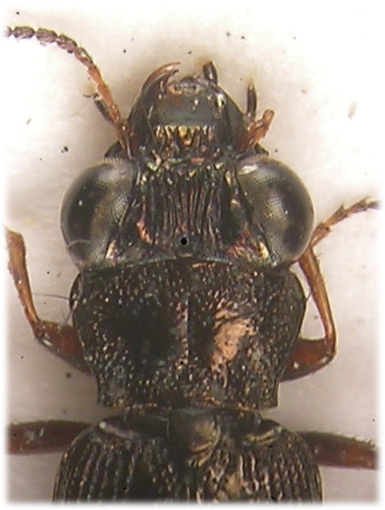 First Scottish record of N.rufipes Curtis. Ent.Rec.J.Var. 105:142-143.